Free blogging is always an issue for beginners. They think about blogging with WordPress. Self-hosted version of WordPress is a useful one but many bloggers go for free one because for them starting with some cost matters a lot. This will definatle right. That’s so true Janitha, free blogging sites have their own downsides as they don’t offer you full control over your sites. But if you’re just blogging for fun or looking to share your thoughts, they are great. Or if you’re looking to make serious money or build your online reputation, then, you should definitely avoid free blogging sites. Sir thank god, i found you on google, to make my dream come true as blogger, I am very new I had bought new domain leaving sub-domain of blogger.com. Sir thank god, I discovered you on google, to make my blessing from heaven as blogger, I am exceptionally new I had purchased new area leaving sub-space of blogger.com. Hi. I use Weebly. I find it unreliable for uploading and posting photos. I use it mainly for posting photos for family to follow my comings and goings. I crashes a lot, especially from my phone. Also, it can not be posted to from my iPad. Most annoying. Hi Anil, Thanks for this amazing list of free blog sites. Except for some 3-4 sites i never heard of these free blogging platforms. Luckily I got through your valuable post and now I’m trying how to get most of these sites. Nice collection of free Blogging Site.You did a great work. Because blogging is one of the best practice every one out there are doing but none of them no the free site.For those who are looking for free website this will be helpful for them. Thanks for sharing it great blog. I am going to create a blog for my recently launched website. I have a question regarding these blog. Are the free blogs useful in terms of SEO? Should I do SEO work on these free blogs also? Hey Allan, that’s a great question. Free blogs are definitely not bad in terms of SEO. Take a look at the WordPress alternatives as well (https://bloggerspassion.com/wordpress-alternatives/) once to see a variety of options. There are few sites that provide excellent SEO features such as WordPress and also provide you full control over your sites. When i started blogging, my first free blogging platform was wordpress.com then when i realize that i cannot make a lot of customization, i migrated to blogger, and in the end i still bought my own hosting and tranfered to a self hosted blog. I recommend if you a free blogging platform, choose blogger. If you’re really serious about making money from blogging, go for a self-hosted WordPress blog as it provides you full control. Self hosted platform like WordPress is where you go to actually download a WordPress and easily install host the WordPress platform on your own server. In recent times, WordPress.com has been the most valuable website for opening a blog website. Well, I haven’t used livejournal.com but all I wish to know are the limitations of all the listed free blog websites from the paid sites? Why do most bloggers use wordpress.com most often? Emmanuel, we have already covered about the pros and cons of free blog sites in this post. Please check this post once and let us know in case you have additional question for us. Hi, Anil Nice collection of free Blogging Site.You did a very good job. Because blogging is one of the best practice in off page and great job this web site provides SEO options and dynamic look for the website. Yes, blogging is definitely a great way to make money online and most of the free blogging sites shared here provide excellent features like drag and drop builder, SEO and so on. So make sure to check out each one of them and use the right one. I agree with you, it can be a great thing to start on a free platform. Although, I started on a self-hosted blog from the get go. You can definitely save money by starting on a free platform. Plus it will help you see if you really want to work this hard to grow your blog. It does take quite a bit of time to grow an online reputation and get people to start coming back. If I was to do it over, I would start my blog on a self-hosted blog again. I wouldn’t want to have to migrate everything later when my blog gets big and popular. Hi Susan, glad to see you around here. 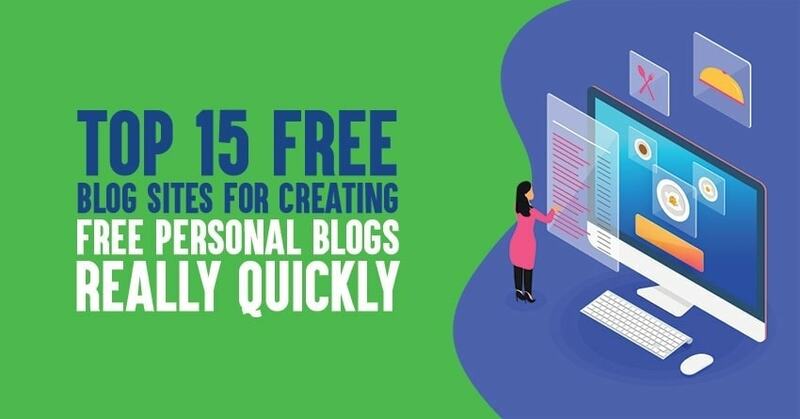 Using free blogging sites, you can quickly launch a new blog without having to spend even a penny as most of the above listed sites provide you excellent features and storage space. Once you find ways to make money from online, you can start using sites like WordPress where you can invest money on hosting, domain etc. Really Great list of Website and very useful, I have often use Weebly.com, this website provides SEO options and dynamic look for the website. True that, Weebly is great for SEO purposes and also used by over 40 million people worldwide. Using Weebly, you can literally create anything from an online store to portfolio sites or SEO friendly websites to drive more leads and profits to your online website. I always tell people when they’re starting out blogging that Free sites like Bloggers is the best way to start out because they allow you to put ads in the header, beginning paragraph of your blog posts, sidebar, bottom of the blog post, and footer of the blogger blog. One thing they want to do when starting a free blog is to make sure they have a copy of their contents either on their desktop PC or automatically sent to Google Drive. The reason for saving a copy of their content to their laptop or desktop PC or sent to their Google drive is because their blog can be deleted anytime for any or no reason. Being that the blogging platform they’re blogging on is public domain and anyone can report their blogs or any or no reason, it should motivate the amateur blogger to backing up their content and using the free blog platform form as an avenue of practice of strategically getting their content marketing ideas together and gaining some type of experience. Or just getting in the consistent mindset of posting blogs daily or every other day. This valuable experience I think will give them the inspiration and the proper blogging mindset so when they purchase their own domain and dedicated web hosting package, they’ll know how to keep going the extra mile in terms of blogging, content marketing, and having a piece of mind not having to worry about getting their blog deleted for whatever reason. I would personally recommend free blogging platforms for anyone looking to gain experience and transition into the mindset of consistent blocking. It gives a person much to look forward to in terms of optimizing their writing style and building relationships with their readers without having to shell out one red cent for it a domain name and hosting. I personally tried Blogger.com back in 2005 when I knew nothing about blogging and affiliate marketing. Back then, I was an affiliate of Walmart.com and didn’t have the complete concept understood about blogging back then, content marketing, and making money in affiliate marketing. Though I made tons of mistakes and didn’t completely understand what a blog was and how it could make money while fiddling with some Walmart ads from LinkShare inside of certain positions in a blogger.com blog, I was able as an inexperienced Internet marketer-blogger to make money from the Walmart affiliate program through my blogger blog and collect a commission check a little over $72. I thought at that time I was really onto something and decided to stick with this line of work as my love slowly and quietly rule for blogging and affiliate marketing. I continue fiddling with the blogger free blogging platform and managed to potentially earn a few more dollars from the affiliate ads in it, some including Google AdSense. Wow, that’s a very lengthy comment and I really appreciate your time for sharing your thoughts with us. It definitely helps new bloggers to pick the right choice for starting a free blog online. I agree with most of your points that one need to take a full backup of their contents as most free blogging sites don’t provide you any backup feature. Apart from that, you also need to focus on finding a monetization strategy as soon as possible so you can move to something better option like WordPress. Unfortunately it’s gone and thousands of people lost their blogs as well. Sad to hear that your precious content is gone. That’s the reason why you need to only pick those free blogging sites with millions of people using it (sites like WordPress.org, Weebly, Blogger etc). Hopefully you’re still blogging on a good blogging platform. great research on blog platforms.your suggested platform very informative for newly bloggers.IN my blogging carrier i have used many blogging platforms like blogger,tumblr etc.but i like WordPress most. Yes, I’m also into blogging for a long while now and I’ve tried so many blogging sites but WordPress seems to be the best option among all. WordPress is, by far, the most popular open source Content Management System which is actually used by approximately 75 million websites. Not only WordPress is free to install and upgrade but you can also find a ton of useful plugins and themes. Veerrry good list of blog platform providers. I saw today many other similar pages, but yours collects indeed the best platforms for blogers. IMHO own hosted (f.i. on a cheap hosting) blog, installed on wordpress or something like that, would be always better choice – there are so much more options, you can use or not, but they are there 😉 But of course, for beginners it could be to difficult, then the better option is a free blog platform like the platforms on your list. Thank you! LiveJournal is nofollow. And SquareSpace is trial only. Try Zoho or SnackWebsites. It doesn’t matter whether it’s nofollow or not as we’re only talking about the free blogging sites. Thanks so much for your other suggestions as well! I am starter blogger person and i follow you last six month your all post and read very careful so you all post useful for me. and i am asking one question can you advise me best theme for starter blogger. First of all, thanks so much for following me for so long time and I’m really glad to know that you’re reading our blog posts, hopefully you’re learning new things. For starting bloggers, there are so many options out there, I suggest you to check out Elegant themes once. Would you mind if I ask you what theme are you using for this blog? I liked it very much and would want a similar one (using same will not be good). I hope you will be able to answer this. Dhakkanz, its a custom build theme which is designed by designer. If you’re using a site only for uploading pics, I think you should better check out Tumblr as most people I see post a ton of photos and it’s also a great platform that offers you a ton of options for storage. So go give it a try if you’re not happy with Weebly. Blog.com is a piece of crap, it never works right and the server is down a lot, it runs slow. Especialy in the last 10 days, it has been horrible. You can only know a blog by actually trying it, don’t tell people how great it if you haven’t used on a daily basis like i have. Shams, we recently updated this post and added 5 more free blog creation sites into this list. I hope this will help you. Please let us know in case we are missing any popular free blogging platform here. ucoz.com is the site which lets you control the way your site works. You can add css, scripts, html, pages, entries, multiple users, multiple subdomains. It provides the option of search through tags, common search. Moreover own themes can be added with full style sheet control. Heard a lot of good things about Ucoz, thank you for your suggestion, will definitely check it out and include it as well in the future. I guess it’s already offering easy to use drag-and-drop website builder with an intuitive interface designed for businesses. Keep sharing more information. Free blogging is always an issue for beginners. They think about blogging with WordPress.org or WordPress.com. Self-hosted version of WordPress is a useful one but many bloggers go for free one because for them starting with some cost matters a lot. Blogspot and WordPress.com are the leading websites which provide opportunity to blog free of cost. You have listed some great websites to use by newbies. Hi Ravi, as you said, free blogging sites are definitely an issue for anyone including beginners as they don’t provide you much control, features, security, storage and so on but the only reason to consider them is when you’re starting out, it’s always better to start for free (unless you’re ready to spend some money on things like hosting, design etc). Thanks for the comment. WordPress.com is the best site for creating blog as wordpress provides various themes and plugins to use . But I think blogger.com is the anathor great site for begginers. That’s what I think about WordPress too. Once you’ve realised the importance of using WordPress.org, you’ll never go back to any other blogging platform. It’s just like becoming an Apple fanboy, once you’re addicted to Apple products, you’ll never go back to something else.